For March 25: "Bywater and the Bearers of Promise" by jan-u-wine, with two paintings. And even as he spoke the earth rocked beneath their feet. Then rising swiftly up, far above the Towers of the Black Gate, high above the mountains, a vast soaring darkness sprang into the sky, flickering with fire. The earth groaned and quaked. The Towers of the Teeth swayed, tottered, and fell down; the mighty rampart crumbled; the Black Gate was hurtled in ruin; and from far away, now dim, now growing, now mounting to the clouds, there came a drumming rumble, a roar, a long echoing roll of ruinous noise. 'The realm of Sauron is ended!' said Gandalf. 'The Ring-bearer has fufilled his Quest.' And as the Captains gazed south to the Land of Mordor, it seemed to them that, black against the pall of cloud, there rose a huge shape of shadow, impenetrable, lightning-crowned, filling all the sky. Enormous it reared above the world, and stretched out towards them a vast threatening hand, terrible but impotent; for even as it leaned over them, a great wind took it, and it was all blown away, and passed; and then a hush fell. I never can let go uncelebrated the anniversary of the fall of Barad-dûr, Sauron's defeat the hard-won fruit of so much sacrifice, particularly Frodo's. March 25 must be lifted up. The birth of Elanor Gamgee, too, must be commemorated. jan-u-wine's Bywater and the Bearers of Promise touches on these things, and, in touching on them, touches me profoundly. The piece is like a series of snap-shots seen from Sam's point of view, snap-shots of the Battle of Bywater and beyond. For illustrations, I have chosen two paintings I think are exceptionally apt. The first makes me think of the image of the despoiled Shire Sam saw in Galadriel's mirror; the second is an almost visionary picture of spring in a rural landscape. ...if an atheist who never heard of Coalbrookdale, could be transported there in a dream, and left to awake at the mouth of one of those furnaces, surrounded on all sides by such a number of infernal objects, though he had been all his life the most profligate unbeliever that ever added blasphemy to incredulity, he would infallibly tremble at the last judgement that in imagination would appear to him. The information for this painting comes from a great article by Neil Cossons, former director of London's Science Museum, viewable in full here. This piece was commissioned late in Millet's career and was part of an unfinished set of paintings depicting the four seasons. A leading painter of the Barbizon school, Millet's painting is both lyrical and poetical. Nature's beauty is to the fore, the human figure a small bright spot in the background of a scene full of high contrast: storm and rainbow, light and dark, bare branches and new-budding growth. 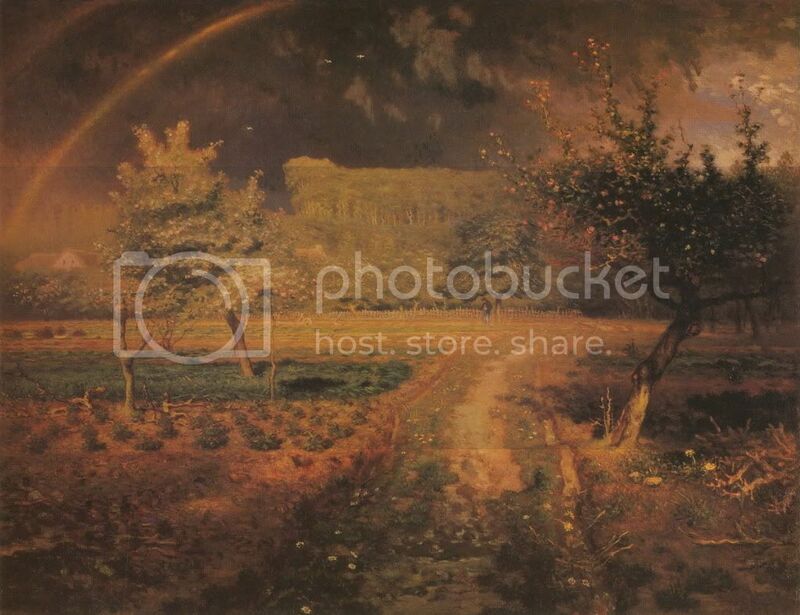 I think the painting makes a beautiful image of the Shire reborn, new life and light breaking through dark, evil times with vigour and loveliness. The copy of the painting posted here is a reduction of a large file I found on the Internet. I love the way it has nearly the same palette as de Loutherbourg's hellish Coalbrookdale, but transformed into the sublime rosy warmth of late afternoon sunlight. The Musée d'Orsay, which owns the painting, hosts a small copy on its site. The colours are very different; cool greens and blues evoke a typical spring. I link it here, to show what the painting probably looks like. May our heroes be honoured. May we celebrate the rescue of the Free Peoples of Middle-earth, the cleansing of the Shire, and, because of Galadriel's gift of earth, its wondrous re-flowering. And may we rejoice in the birth of Elanor the Fair, Bag End's star-flower. How many here as have seen a man die? descending like uneasy rain to the mouth of the earth. or a brain from its grey cage. and given naught in return? It was quiet at the Cotton farm. quieter still in the poor parlour. on a day grey'd with despair. all the Shire gold as ever the Lady's mallorn. And my Rosie wed me. there in the Party Field beneath the calm blue sky. I suppose, somehow, I thought he was nigh to his same old self. As these things happen, my Rosie-lass bore me a child. A girl-child, a lass of star-flower-gold locks, and not the Frodo-lad we'd expected. a name of magik and memory. I never heard him laugh, not ever, again, after that. And now he has gone. and left naught but the bare bones of a pledge. *that* we are no longer. Bearers and keepers of a promise. Previous entry: In Dremes by jan-u-wine, plus three paintings, [date]. Thank you for remembering this day. I need to go post something I prepared last night if LJ will let me. It's so slow this morning! I love the way Jan depicts Sam in her work. She's deepened and expanded my sense of him as a character, and my love. Sometimes he's depicted as so simple and so rustic he could never have had the perception and powers of observation to have finished the Red Book. I'm so glad this was a meaningful post for you, Shirebound. I will be browsing the old f-list shortly. "I never heard him laugh, not ever, again, after that"
I was reading this at 630am with tears in my eyes. The words shed so much insight into the pain and *silence* in what is left of Frodo through Sam. Simple and loving Sam. Jan's words are profoundly beautiful and the pictures show the Peace that comes from the shire, a peace that Frodo never truly had there on his return. I'm glad you stopped by, Mews, and that you found the piece moving. I love to see the day honoured. P.S. Your icon is brilliantly done! beautiful. I enjoy these so much. Apologies for not commenting recently, Mechtild. Computer woes! Having just about caught up with your recent entries, and with my ancient spare PC cooperating for the moment, I wanted to pop in while the going is good to say how much I have enjoyed them. It hurts to know that many of his fellow hobbits saw Frodo as lacking in courage due to his refusal to use or even carry a weapon upon his return, or for his benevolence towards those who had caused great hurt to the Shire and to himself. Well, that was his way. He may not have wielded arms as a warrior, as others had, but the suffering and torment Frodo had endured against unimaginable (to a ‘normal’ hobbit) forces required courage and bravery of a different kind, and those who mattered most to him knew the truth ~ or most of it. In Karen Milos' thought-provoking essay 'Too Deeply Hurt, 'the author suggests that: 'Saruman, having failed to stab Frodo with his knife, resorted to stabbing him with words that could not help but insinuate themselves into Frodo's vulnerable mind, haunting him and magnifying every memory and every pain into a portent of doom.' It's heart-breaking to imagine that Frodo, after warning his fellow hobbits of Saruman's deceptive tongue, should himself fall prey to the wizard's vengeful words. I have loved the paintings you have chosen to illustrate these entries too. 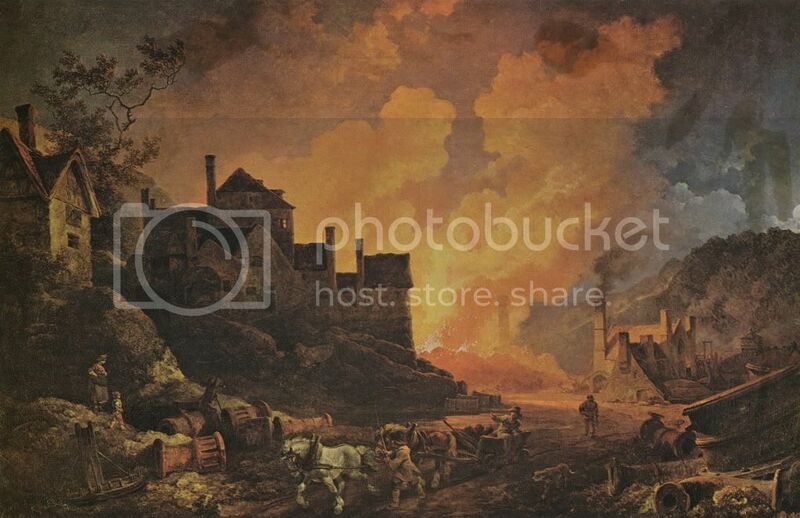 The Coalbrookdale picture is an inspired choice, reflecting the scenes of devastation the Shire-folk would have witnessed during the Scouring. (I have visited Ironbridge Gorge several times ~ it is close enough to us for a day trip by car.) The accompanying image, ‘Spring,’ with its similar colour palette depicting a very different mood, is a fitting contrast to that grim, industrial landscape. Well, I have gone on for too long. Thank you both, Jan and Mechtild. What a beautiful comment, with so many good thoughts carefully observed. I'm so glad the illustrations "worked" for you, and that this poem touched your heart and mind. I have read Milos' piece on Frodo and PTSD, a piece recommended by many a Frodo fan. But you've been to Ironbridge Gorge? Is that what it should be called rather than the Severn Gorge? I was wondering, too, if the place had been made into a museum [of the age of modern industry's beginnings], or if it was the site of active industry. I was going to email you this weekend, wondering if you were all right. I had missed your posts here, but also had missed seeing them in "A Journey With Frodo". I thought perhaps you were ill, or your husband was, or that some other crisis had come upon you. I sent a message to Paulie asking after you, but she said, no, you only were having serious computer problems. What a relief! (Not that you are having computer problems but because it wasn't something worse.) I'm so glad your "ancient spare PC" is serving as back-up. And I hope you are able to get a lasting computer fix soon. Thanks so much for stopping in, Blossom. I always look forward to reading your comments. Thank you for your concern, Mechtild. Yes, all is well enough in RL ~ apart from our dog being diagnosed with diabetes a couple of months ago, but she is doing well on her daily insulin injections and a strict diet ~ it is merely my temperamental computer keeping me quiet! Many thanks again ~ Blossom. Thanks so much for the informaton and link, Blossom! It sounds like the area can't be the cess-pit it was when they were dumping everything in the river. The natural scenery sounds wonderful. And best wishes on the early diagnosis and treatment of your dog. A lot can be done to help pets with diabetes these days, just like with people! Another lovely poem by jan-u-wine. I am so glad you are posting all her masterpieces. Now onto more! God bless. Thank you for stopping by and commenting, Antane. I'm sorry I didn't respond earlier; I've been away for two weeks on a family visit (with no internet). Jan-u-wine has a very, very special gift.